Miss Tucker, otherwise known as Miss Roosevelt, as Madame Rosavella, as Madame Macchetta, and as Countess or as Marchesa Allegri, probably shouldn’t be in this collection. Her career as a vocalist was limited and rarely successful. But Blanche Tucker was skilled at getting herself noticed. At getting herself written about. She was also a decidedly striking woman. And that was, in truth, largely the trouble. The best thing about her singing was her looks. The ‘exceedingly fair American with magnificent red hair’, as Frank Harris described her, was time and again given opportunities beyond her vocal capabilities, because of her physical appearance. And the result was what might have been expected. Blanche Tucker was born in Sandusky, Ohio, the eldest of the three daughters of William H Tucker, a Virginian lawyer and politician who in the 1850s made his home in La Crosse, Wisconsin, and was later elected to the US senate as a representative for his adopted state. Her mother was Elizabeth Letitia Roosevelt, known as Lizzie, a daughter of Nelson Roosevelt, ‘one of the New York Roosevelts’. Blanche preferred, for some reason, usually to say that she was born in Chicago (‘and lived through the fire’). And, usually, gave a date something like five years after the actual date of her birth. But truth and the published history of Blanche Tucker very often don’t go hand in hand. Even the red hair. Which was pretty certainly dyed. For when. in 1873, Blanche took out her first passport, in order to go to Europe to study, she admitted to being 19 years old, 5ft 4 1/2ins tall, and blonde. She hadn’t yet started muddying her data, any more than had her parents, in the La Crosse census of 1860 – where the Tucker children were listed as Eugene 8, Blanche 6, Celia (actually Minnehaha Cecilia Francesca and later known as Minnie) 4 and Fanny 6 months. So. Nineteen year-old Blanche Tucker left America for Paris in 1873. She says she was sixteen and went as musical correspondent for the Chicago Times. A local paper reported at the time ‘Miss Blanche Tucker of Chicago, a young amateur vocalist, has arrived in Paris bearing warm letters of introduction from Pauline Lucca to Madame Viardot Garcia who is to have entire charge of Miss Tucker’s musical education’. Apparently, Madame Viardot was not in charge for very long, for Miss Tucker is next heard of in Italy, a pupil of Trivulzi, where she is said to have appeared in concert in Milan, while writing copy for the Chicago Times. Still, somewhere along the way, in any case, the fair young American came to the eye and/or the ear of Mr Ernest Gye of the Covent Garden English Opera, and the said Mr Gye engaged her for the 1876 London season. Blanche says they engagement was for eight years. It ended up being less than eight performances. 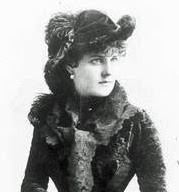 Madame Rosavella made her operatic debut on 15 April 1876 singing Violetta in La Traviata. ‘She is extremely good looking’ remarked the review the next day. ‘Avant tout une beauté’, echoed the French press. That was not enough for Mr Gye, who dropped her from the Covent Garden bills after three performances (15, 18 April; 3 May). Blanche worked out her engagement, instead, with one more Violetta at the Alexandra Palace (15 May 1876), singing such as 'Ah fors'é lui' and 'Parigi o cara' at the parallel Floral Hall concerts, and, later in the year, in the theatre’s promenade concerts. During 1877, she was again seen in concert in London, before heading out on a tour in Holland and Belgium, and ending up in Italy where, towards the end of the year, or so it was reported, she became the wife of one Agosto Macchetta, later to be titled Marchese d’Allegri. 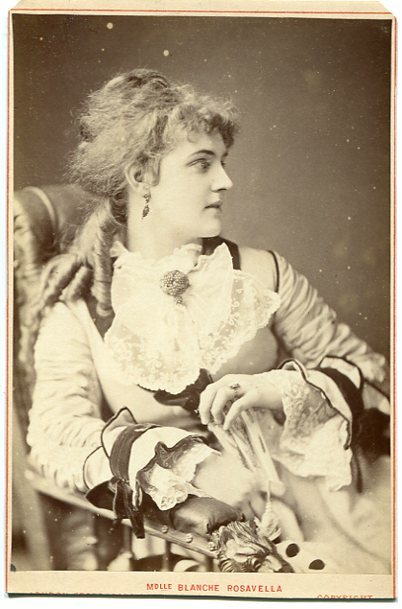 Madame Macchetta, Countess d’Allegri was, of course, much more socially interesting than Miss Blanche Tucker of Wisconsin, and the press duly gobbled up the bits of ‘information’ concerning her that were liberally flung its way. She was reported as performing at, or more often ‘going to perform at’ the Vienna Staatsoper as Filina in Mignon, in Faust at Versailles, or in Rossini’s Otello somewhere or other. Maybe she did. Maybe she didn’t. I haven't found any of these. Maybe the engagements were as durable as that at Covent Garden. Certainly, she was announced by Brasseur of the Théâtre des Nouveautés to appear as Lydia, to the Vladimir of Mlle Preziosi, in the Paris production of Suppé’s Fatinitza (15 March 1879). But she didn’t. She was replaced, for incompetence and unprofessionalism, before opening, and of course she sued noisily. Brasseur went to court and said her French accent was lousy and that she kept skipping rehearsals, but, predictably, he lost 4,000 francs all the same. Gilbert, Arthur Sullivan and Richard D’Oyly Carte were, for copyright reasons, planning to open their new comic opera, The Pirates of Penzance, in America, but Helene Crosmond, whom they had approached to play Mabel, had put herself financially out of their court. As a result, they turned to Blanche and, a few weeks later, they, with their new American prima donna and an otherwise British company in tow, set forth to New York on the Bothnia. The Carte company arrived 4 November and opened at the Bijou Theatre on 1 December 1879 with HMS Pinafore, with Blanche again playing Josephine, alongside Hugh Talbot and J H Ryley. The local press was not impressed: ‘[she has] a small soprano voice of limited register in which there is much of amateurish indecision and she was decidedly disappointing in a vocal way. She has a very handsome presence however and tried to act, although with little success’. When The Pirates of Penzance opened on 31 December, Miss Roosevelt became the first ever Mabel. Messrs Gilbert, Sullivan and Carte did not persevere long with their association with the lady, but another light opera producer, their American ally John McCaull, took their place and put up the backing for what was dubbed the Blanche Roosevelt English Opera Company. The company launched a Broadway version of Alfred Cellier’s successful British comic opera The Sultan of Mocha (14 September 1880), which failed in thirteen nights, and subsequently, in Boston, his new The Masque of Pandora (Boston 10 January 1881). Cellier’s Nell Gwynne, with Miss Roosevelt in the title-role, was also announced. Amateurish and underprepared, the whole affair came quickly apart, and Miss Roosevelt’s retirement from the stage was announced. In fact, she was not yet quite finished. In 1881 she appeared in New York in a number of concerts and the regular number of newsworthy carriage accidents (she had previously made the papers as having had a hotel ceiling collapse on her while in bed), and, after a new visit to England, she was picked up by Moritz Strakosch for his touring opera company. 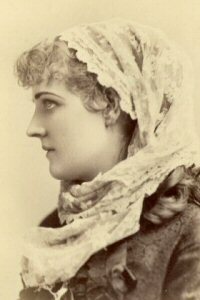 She opened as Marguerite in Faust at the French Opera House in New Orleans (‘a splendid looking woman...’), and was promptly replaced by French soprano Maria Leslino. She even returned to Broadway in a repeat of her Pirates of Penzance role, but the reaction was no better: ‘a beautiful girl, somewhat uncouth in her gestures with a well-taught but bodiless voice which gives promise of effect but, alas, breaks the promise to the ear’. And so, after a career of pretty undiluted failure, Blanche Roosevelt bowed out, and Madame Macchetta returned. 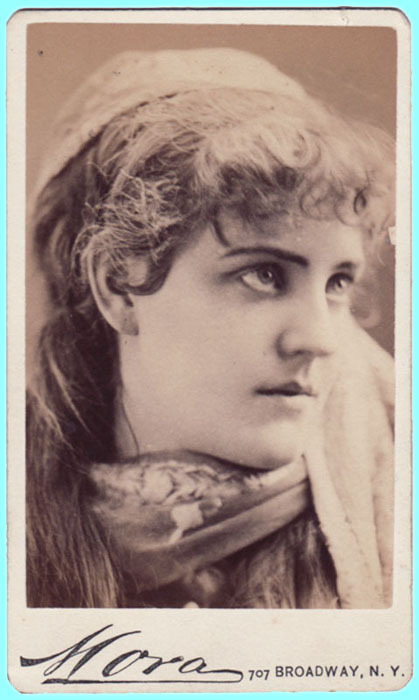 She returned, however, not as a vocalist but as an author, with a book based on her experiences entitled Stage Struck, or She Would be an opera singer (1884). She followed up voluminously with such titles as Married in haste, and The Copper Queen (both, like the first, sounding more than a little wishful-autobiographical) before going into non-fiction with works on The Home Life of Longfellow, The Life and Reminiscences of Gustave Doré, Verdi, Milan and Othello and Elisabeth of Romania. She also kept up a position in the gossip columns with tales of her ‘intimate connections’ with the great and the famous. Quite how intimate she became with Longfellow and the Queen of Romania, I do not know, but her relationship with the novelist Guy de Maupassant apparently left little to the public imagination. Mme Macchetta was, for a time, openly his mistress. The career of Madame Macchetta, authoress and journaliste, however was not doomed to last very much longer than that of Blanche Rosavella, vocalist. The sometime Blanche Tucker died in London in 1898. Her death registration said she was 42 years of age. Her gravestone apparently makes her 38. She was, in fact, a little less than a month under her 45th birthday. Before her affairs could be settled, a creditor attached the estate for a debt of 107 pounds. The Marchese d’Allegri, whom she seems to have shed, said he wanted nothing. But the creditor didn’t get his money. Blanche, so it eventuated, had nothing to her name but a few clothes and three trunks containing the manuscripts to her books. And no one wanted those either.